Secrets are the foundation of power! Shockwave is the ultimate spy. Able to change his voice, energy signature, and even his appearance at will, he has spent years infiltrating the Autobot power structure. Graduating near the top of the class from the Autobot Academy, he moved through the ranks of the Elite Guard, eventually becoming head of the Intelligence Division. Not once did anyone suspect the bright, friendly Autobot known as Longarm of being a devious enemy spy. Robot Mode: Shockwave is quite unique in that he has two different robot modes, one an Autobot and one a Decepticon, something only two other Transformers have had over the years. His primary robot mode - the real him so to speak - is Shockwave, a Decepticon. Shockwave is very tall and thin, standing almost as tall as a Leader-class figure. His face features the single optic we've come to except from Shockwave, though the way it's put together makes it seem as if he has two eye slits below it. This very posable robot has clawed hands and each of the three finger-claws can be moved separately. For a weapon Shockwave carries the turret of his tank mode, which can be fastened to either of his forearms. The joints are tight enough that he can hold it level without problem despite it being quite big. So all in all a very good, very well-designed robot mode without any problems I can think of. As a spy Shockwave has a second robot mode. This is the Autobot Longarm Prime. It takes but a few changes, but the resulting secondary robot mode looks quite different. Not so different that you can't still tell they're the same, but anyway. Longarm is quite a bit shorter than Shockwave, but broader. He has no neck to speak of and looks as if he's wearing a heavy helmet or something. Unlike Shockwave he's got a real face (sort of) and actual hands (though they can't hold anything). Longarm can, of course, also use the tank gun as a weapon, but he's meant to wield it in crane mode (see below). The only slight drawback here is that the Decepticon logo on the tank turret/crane can't be hidden. It's visible when Longarm wears it on his back pointing up or down. Apart from that, though, a very well-made secondary robot mode that looks quite a bit different than the primary one. So to sum up what I think of Shockwave's robot modes: Pretty darn impressive! I don't own Punch/Counterpunch, the original Transformers double spy, so I can't really compare the two, but Shockwave/Longarm has certainly taken me by storm. Very well done. Alternate Mode: Shockwave goes one step further than Punch/Counterpunch in that he not only features two different robot modes, but also two different vehicle modes. One for Shockwave, one for Longarm. Shockwave transforms into a Cybertronian tank. The vehicle isn't much more than the robot lying on its stomach with the tank turret fastened to the back, but the execution is done well enough that you barely notice. The only slight flaw here is that you can catch a glimpse of the robot head (Longarm's head, to be precise) from certain angles, as it sticks out the front. Still, the tank threads are nicely detailed, as is the turret itself, which can swivel a full 360 degrees and the the barrel can be raised, too. So while it isn't the most spectacular vehicle mode ever, it does serve well enough. Longarm's vehicle mode is but a slight variation of the tank mode. The barrel of the tank folds together and turns into the arm of a crane, while the tank threads fold downwards to turn into 'legs' of a sort. The result is a crane on a four-legged platform and the whole thing doesn't look half-bad. It's still quite apparent from certain angles that it's actually a robot on all fours, but overall it looks good. While the two alternate modes aren't anywhere near as good as the two robot modes, they both work well enough and give Shockwave the ability to transform in both Decepticon and Autobot guise. Remarks: While he bears only a fleeting resemblance to the original Shockwave, Animated Shockwave made quite an impact in the Animated series (where he is voiced by the same voice actor he had in G1, Corey Burton). 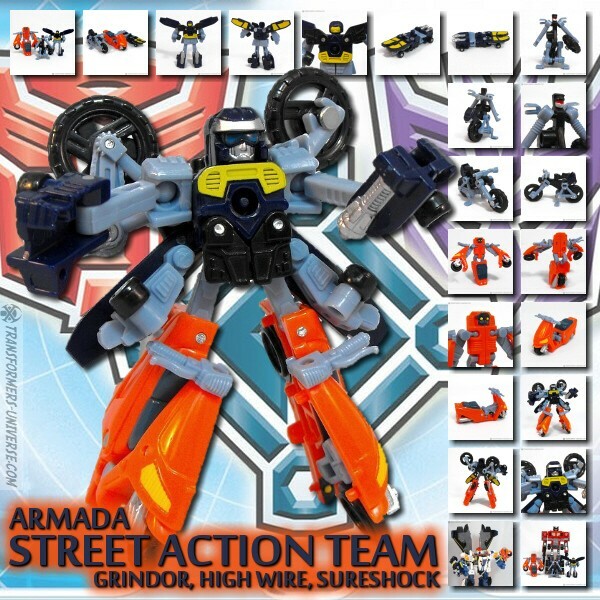 In his guise as the Autobot Longarm he attended the Autobot Academy alongside Bumblebee and Bulkhead. Bumblebee and Longarm even struck up a friendship and captured the supposed Decepticon spy Wasp together. BB only learned that Longarm was actually the spy when the Decepticon, by now a Prime and chief of Autobot Intelligence, aided Megatron in his bid to conquer Cybertron. It remains to be seen what Shockwave's fate will be in the third season of the Animated cartoon, now that his cover has been compromised. Shockwave is more than an awesome cartoon character, though. The toy impressively brings the double spy to life, giving him two distinct and working robot modes, accompanied by two vehicle modes that - while not quite as good - also work fine. Shockwave takes the idea behind the original double spy, Punch/Counterpunc, and runs with it, producing a mighty fine toy that I can fully and without reservation recommend to every Transformers fan.